Radiator Blog: Souvenir and abstraction. 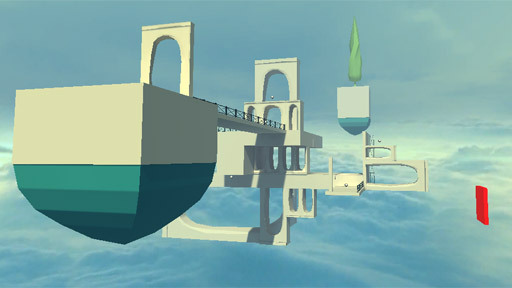 I was the main artist on Souvenir and did the bulk of environmental modeling / level design / art effects. The cypress tree and archway were one of the very first things I made. We needed an art style that would emphasize simpler forms with very little surface detail, and we made a very early decision to pursue a papercraft / untextured color direction. Otherwise, the UV mapping required would be time-consuming and cost prohibitive and wouldn't really look good anyway because I'm not a great painter. 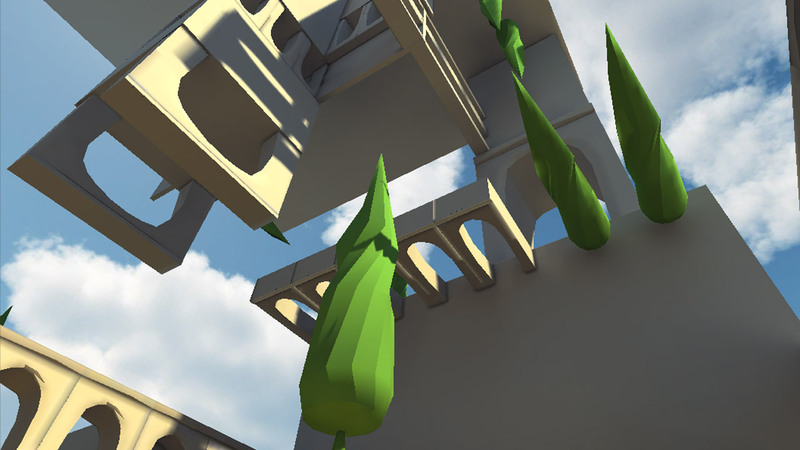 There were also huge performance gains in using just one small palette texture for virtually every environment mesh in the game; that means Unity can batch all the polys efficiently and reduce overall draw calls. Huge game worlds usually have to be optimized for rendering; however, thanks to this already optimized art style, I'm proud to say we didn't waste a single minute on trying to squeeze performance out of it, and we still have a lot of wiggle room to add more stuff. This process reflects what I've been saying for a while: if you want to finish something, your art assets should reflect the needs of the actual game. But if you never want to finish anything, well, ignore that. (b) make 5-10 decent-looking models in a real mod or game that people will play, the game gets finished, it goes viral and get you even more press, you show prospective employers that you know how to get stuff done, AND people outside of Polycount or GameArtisans will actually see and experience your work. To me, option A is like putting attribute points into Energy in Diablo 2. It's the worst way to draw attention to your work or to improve as an artist. Option A is a trap. 2) Snap all UVs to a single point. No re-topo, no re-projection, no playing with seams, no fiddling required. Get in, get out. Anyone can do it. (Though skilled artists probably get more mileage out of it.) Many of our props have strange topology or N-gons; but very few people notice or care. We let technology take care of it. In fact, for one presentation, we had a build with completely corrupted lightmaps and people didn't really care or remark upon it. People rarely notice what isn't there, even if it's horrible and glaring to you and a small handful of skilled artists. You, the game maker, set their expectations. 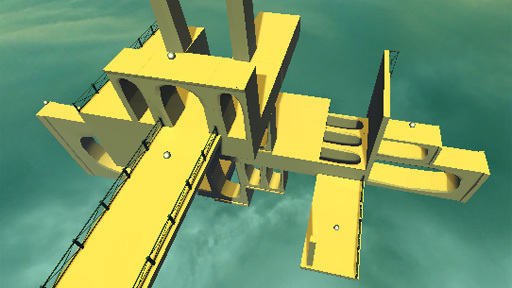 They have no concept of edge loops or smoothing or lightmaps. To them, everything is intentional. That's the power of abstraction in art direction. Use that power. It's yours. Souvenir prototype (build 08) is public! "What were the main trends of GDC 2012?"